What Everyone Seemed To Miss After The GOP Debate | Virginia Right! It’s been 22 hours since the 9pm debate began Thursday night in Cleveland, Ohio. The last 20 hours have been filled with talk of winners and losers, moderator decorum, and howls from every conceivable angle. What have we learned? In a shocking turn of events, those who loved The Donald at 9pm yesterday, still loved The Donald at 11pm. Their mission over the last 20 hours has been to slam the FOXNews moderators and praise Trumps’ courage at standing alone as the only candidate willing to jettison all hope of a Republican victory in 2016 with a 3rd party challenge. After Rand Paul went toe to toe with the raucous Chris Christie, none of the Rand Paul supporters said to themselves, “Damn it, that Christie is right! Screw the Fourth Amendment!”. There are many wings to this Republican Party and each candidate is drawing upon their own base within the party. Rand Paul and Donald Trump actually had the easier job. Rand Paul had to inspire his libertarian-leaning Republican Base, convince them he was willing to fight, and that their donations would not be given in vane. Meanwhile, Donald Trump just had to be Donald Trump. Easy-Peesy. Ted Cruz, Ben Carson, Mike Huckabee, Scott Walker, and Marco Rubio had the most difficult job. They are all fighting over the conservative Republican Base. This is a base comprised of Constitutionalists, grassroots activists, and Social Conservatives. These were the candidates that needed to have the biggest nights. They all did well. There were no knock out punches thrown. They introduced themselves, their identities, their political philosophies, and highlighted the central themes of their particular campaigns. On the other side of the Republican divide we saw Jeb Bush, Chris Christie, and John Kasich attempt to appeal to the establishment wing of the Republican Party. This was maybe the most interesting grouping to watch and evaluate. I can’t remember anything Jeb Bush said last night, to be perfectly frank; but Kasich, whom I absolutely loathe and would never vote for under any circumstance whatever, had a great debate. He was overly emotional and caring, which led many analysts to assume that he might have crossover appeal to moderate Democrats. Also, if Jeb Bush isn’t going to show up to these debates and John Kasich does, the Governor of Ohio has a real shot at earning the full throated support (and most importantly the money) of the billionaire class and their underlings. It seems obvious to me that John Kasich and Carly Fiorina are in this campaign to win the Vice Presidential nomination for the Republican Party. After last night, however, Governor Kasich might just think he has a chance to win this thing. That’s the storyline everyone’s missed. Can Jeb Bush and his Goliath SuperPAC actually be dethroned by the Governor of Ohio? It’s an interesting question and in the next debate, we’ll see how much of the hype Governor Kasich has bought into; because if he thinks his real competition is Jeb Bush, he’s going to have to start making the case for why the establishment Republicans ought to vote for him over Jeb. This is risky, because what he really wants is to be Jeb Bush’s VP… but maybe, just maybe, Jeb Bush might have to fill another position held by his illustrious father: Vice President of the United States. We’ll see. 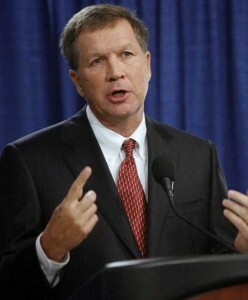 Kasich is Pro Gay Marriage and a tax and spend PRO MEDICAID EXPANSION GOVERNOR. The only reason he is in the race is to become the VEEP for Jeb and deliver Ohio. Jeb Bush, Marco Rubio, and Lindsey Graham are Industrial War Complex Candidates. Like Wounded Warrior Commercials- want to see more veterans with their arms and legs blown off on TV? They are your candidates. Mike Huckabee is a Liberal Progressive Tax and Spend Medicaid Pro Common Core Governor. Marco Rubio’s campaign is being funded by a Jewish Billionaire Car Dealer from Philly. Rubio will take America into a Third World War in the Middle East to protect Israel. Walker is a college drop out who married a woman 12 years older than him and after 12 years as governor living in a FREE HOUSE- has a negative personal net worth- he is loaded with Debt in his personal life. His wife Tonette is pro gay marriage. The fact that the Koch Brothers are funding Walker should tell you he’s a Chamber of Commerce Capitalist Crony Pro Amnesty candidate. Ben Carson, while a nice guy who would make an excellent Secretary of HHS is a shrinking violet, after 8 years of Obama, a candidate with no voting record well….he’s unelectable. That leaves Ted Cruz ( Conservative constitutionalist) and Rand Paul ( Libertarian) . Get behind one of the two constitutional candidates NOW. IF everyone would turn off Fox News in Protest of that debate Thursday night, Fox would get the message. The 24 million viewers who tuned in are giving them a False “high” about their deviant behavior. Bret Baier is still “giddy” with himself over the numbers. What a goober. While getting sick listening to Megyn Kelley make statements instead of asking questions and Brett Baier carry the water for his bosses opening with the question to Trump, their as is-go along to get along Government as usual mantra- did not change Trump’s resolve to shake this RHINO big money group supporting Jeb (the dull tack on the stage ) up! Fox News is getting more like CNN every day, they are clueless as to why Trump is so popular. It makes one wonder how much money Murdoch and Ailes have invested in Jeb and their business as usual government corporate cronies! Go Ted Cruz, you were great ! Read what Dan McCarthy wrote about Paul in the American Conservative- the comment section is very telling. LaCivita has destroyed Rand Paul’s chances. Rand needs to dump LaCivita NOW if he has any chance. He ruined Ken Cuccinelli and now he’s ruined Rand’s campaign. Scott Walker reminds me of Tim Pawlenty- the former Governor of Minnesota who thought he was going to be PRESIDENT. BORING. Pawlenty couldn’t get out of Iowa and flamed out that day. Scott Walker doesn’t play in Peoria- if you know what that means. I was very disappointed with the debate. No one said education is a state and local issue and should not be regulated – other than civil rights – at the Federal level. No one questioned the effect of Iranian sanctions on the people of Iran and wondered if the sanctions are a moral way to prevent a nuclear bomb? I learned very little about the Iran deal – good or bad. Cruz probably was the best; Rubio is a fabulous speaker and I did not know he was that talented. Trump (and some others) lacked details. Disappointed in Walker but I may have been expecting more verve there. I still support Governor Gilmore. Ted Cruz for me & mine & Rand Paul as a default. Otherwise, I hate to admit it but America is toast. John Kasich was best candidate hands down. Ready for a Republican with brains for a change. Lock in Ohio in the general and have a technocratic government in January 2017. Only Republicans with a prayer of winning.